Advanced methods of discretization for integrated design, optimization and analysis of solids and structural components. Patient-specific virtual and in-vitro fluid dynamics, in particular for aortic aneurysms and dissections. Micro-macro multi-scale models to describe 3D printing processes. Non-Newtonian polymer models to describe 3D printing processes. Computational models to support and optimize metal print. Numerical finite-element and isogeometric methods. Numerical “phase field” methods based on isogeometric analysis. Mechanical behaviour of materials and processes (micro and macro scale), model validation, development of ad-hoc methods of virtual simulation. Simulation of thermo-mechanical materials behaviour (both standard and advanced materials). Development/characterization of new materials for the 3D printing of structural elements for buildings, using local and low environmental impact prime materials. Development/characterization of highly-deformable and high-performance materials for FDM 3D printing. 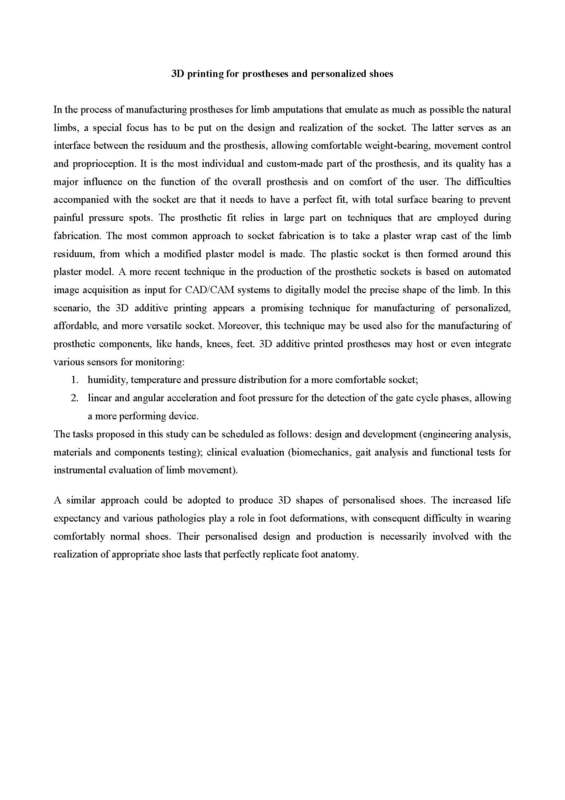 Development of biocompatible materials for FDM 3D printing and application in regenerative medicine and cell growth, even under extreme conditions (space), or in veterinary for bone fracture healing plates. Development of new materials and processes allowing the printing of metallic and ceramic materials using low-cost 3D printers. and ceramic materials using low-cost 3D printers. Development of innovative processes allowing the printing of alloy and ceramic materials. Investigation on the feasibility of producing in-house metal printers based on the laser melting approach. Optimization of FDM printing for highly-deformable materials (e.g., silicone) and for high-performance materials, even under extreme conditions (space). Architectural models and urban studies at smaller scales. Production through AM of entire buildings or building components. APP_2: AM for medical field. Anatomical models for surgical planning or in vitro-testing (e.g, general and vascular surgery, otolaryngology, orthopaedics). Prototyping of new devices for surgery, clinical practice and didactic activities. Devices for mechanical test on biological materials. Scaffold for cell-culture and tissue regeneration (e.g., dental surgery and orthopedics). Personalized prostheses for limb amputations (with a focus on socket and prosthetic components, including possible sensory systems) and personalised shoes for foot deformations. More information from Prof. Danese here. Microfluidic channels for human locomotion energy harvesting. APP_3: AM for the biology, chemistry and pharmacology. Experimental in-vitro models for drug-delivery systems testing and 3D cell-culture systems. Polymeric scaffolds for tissue regeneration. 3D bio-scaffolds for tumour cell-culture endowed with vascularization system, to replace animal models in bio-distribution studies and to test anti-tumour drugs efficacy (e.g., boron vectors in BNCT applications). Micro-chambers for in-vitro reconstruction of specific neuronal circuits. More information here. 3D model of bone marrow to study blood platelet production using silk based biomaterials. 3D polymer and composite microfluidic systems for energy harvesting. Micro-scale reactors for experiments in-operando conditions on catalysts using synchrotron radiation. Design and preparation of continuous flow (photo)microreactors for applications in organic synthesis. Printing of crystal structure models in 3D. APP_4: AM for new production system in the industrial field. High-precision fluid-dynamics valves for biomedical/industrial applications. 3D shapes to build custom footwear forms. Non-contact laser measurement techniques for low cost 3D imaging objects produced by 3D printers (quality assessment, defect detection). Low cost microwave components and antennas of unconventional shape. Meta-materials based on micro-engineered structures, for compact and high performance planar antennas. APP_5: Additive manufacturing for arts. Reconstruction of ancient cities for research in historical/philosophical /archaeological field and for exhibition purposes Study, preservation and exhibition of works of art, prototyping of architectural structures, decorations and frames for exhibitions. Integration of missing parts in sculptural and architectural restoration, replacement of sculptures located in open areas. 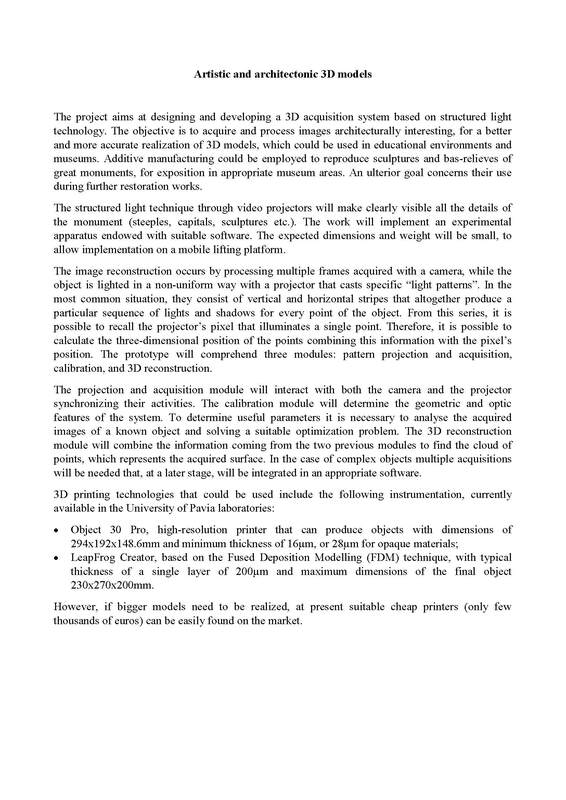 3D acquisition system based on structured light technology, to acquire and process architecturally interesting images. Models to be used in educational environments/museums or during restoration works. 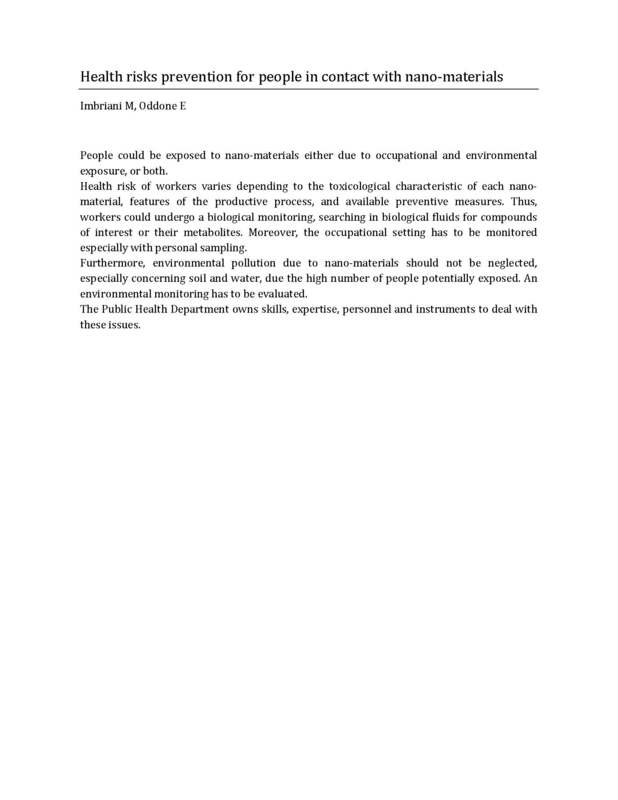 Health risks prevention for people in contact with nano-materials. Research and industrial patenting of new technologies or products realized through rapid prototyping. Knowledge transfer, with attention to target community. Ethical/philosophical analysis of technological advancement and products to be nested in cognitive theories, together with ethical and social consequences. Abductive cognition analysis in relationship to ethics, violence and technology. Future industrial scenarios on a local (Pavia2020) and global context, new frontiers for primary activity outsourcing. 3D printing for SME/startup, mass customization; role of FabLabs on innovation eco-systems, economic/financial sustainability/revenue models. Support to start-up covering “leading change” thematic. 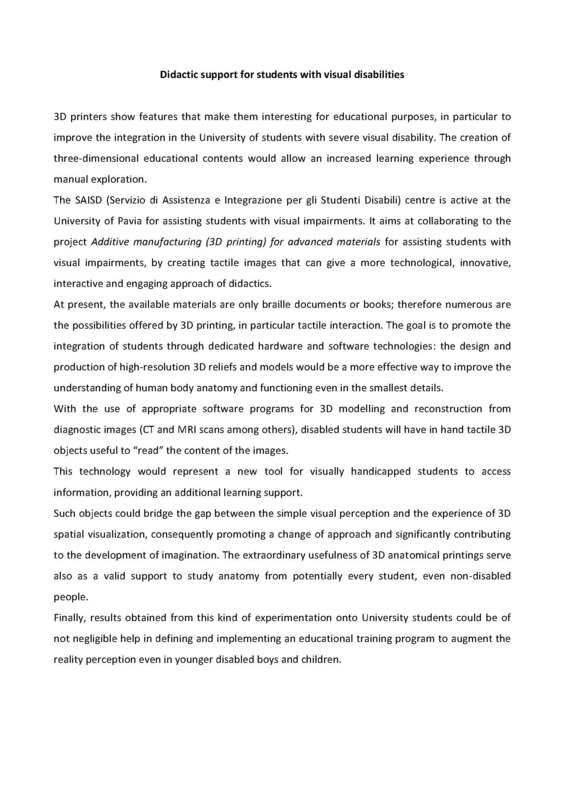 3D printed models for educational purposes, in particular for students with severe visual disability. 3D educational contents to increase learning experience through manual exploration. Collaboration with SAISD (Servizio di Assistenza e Integrazione per gli Studenti Disabili) centre of UniPV. Business models for 3D printing, including : source and origin of competitive advantage; sustainability analysis of cost structures and revenue; design of business model to protect business against imitation where patents & IP are not applicable; analysis of the scalability. 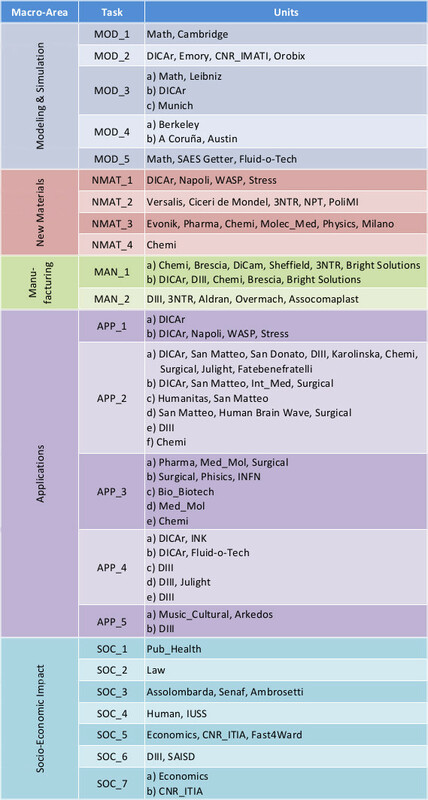 Business models for integration of AM into hospitals.